I got an ebus 2.1 adapter from FHEM-Forum which is sending data over WLan and it still works with FHEM, but now I wanna try OH2. Therefore I’ve downloaded Alpha 15 of ebus 2.0 Binding and put it in my Addon-Folder of OH2. After that I could see the ebus-bridge and configured it with the IP-Address and port of ebus-adapter. The Status of Bridge is ONLINE, but without receibing any data. Do I have to config anything more? could you provide more information on your setup. Witch adapter, WLAN ? 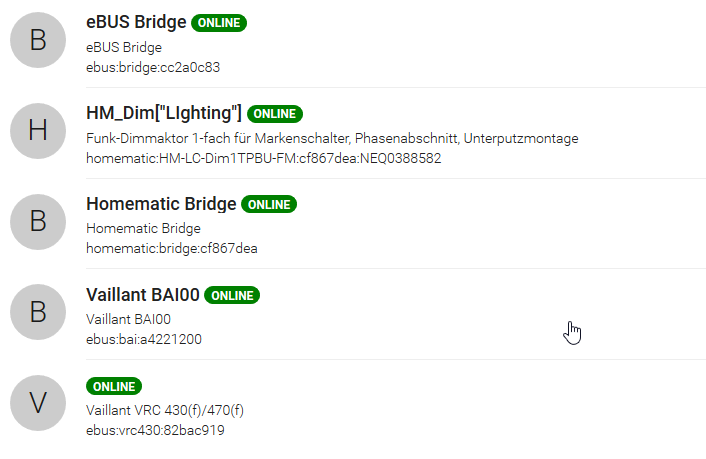 Can you see messages on the openhab console? Well I got this adapter and it works well with my hardware. Sorry but I’m a really newbie on OH2. When I’m at home I could post what smarthome.ebus devices shows or what do you need? After a quick check I think this is not a normal Ethernet adapter. It looks a bit smarter. So this binding is maybe not compatible. But I had no time yet to check the details. I’m not sure if @ChrisPe uses an Adapter with an embedded ESP. You added the vrc by Hand? Or has the binding discovered this thing? @Allodo, What happens when you connect to the ip and port with an advanced terminal, like RealTerm ? @csowada, by the way, I saw you started to implement udp on Github, did you progress on this ? I’m still looking for a way to reconnect to the network port once disconnected, and using Wifi this is not that unusual. Since the connection is refused, it’s possible the TCP port is still used by another connection, maybe ebusd ? @ChrisPe, possibly, I was just looking into this. Now I see the Esera device can be configured to be a server or a client. Which operating mode should I select to work with the binding ? I’m not sure what you mean. I inserted the Jar-File to Addons an then I see the ebus-bridge on Binding. In there are a lot of Things which I can choose e.g. Vaillant VRC430/470 and so on. Anything else I could post to solve my problem? Well I got an VRC470 and no VRC430, but how could I say that to the Thing? This is possible because FHEM is running on another Rpi2. I do not have the interface right in front of me, but logically the esera device should act as a RAW telnet server, and the ebus binding act as a client. I have a VRC470 as well, and it’s detected out of the box. Oh you mean you have another connection on your adapter ? The TCP server can accept only one connection at time, so the other one should be disconnected before starting the OH2 ebus binding. I’ve now deleted the ebus-config from my fhem.cfg so that FHEM didn’t know the ebus-adapter. Do I have to restart OH2? What do you mean, it’s detected out of the box? When you choose the ebus-Binding there is only the VRC470 or what did you do? Which Port do you use? The ebusd-TCP-Port or the Management TCP port? You should only add the bridge with the port 8889 in PaperUI, then auto discovery should find additional things for you. Okay, then I delete the actual bridge an configure it new. Hope it works!!! Will things be find immediatly or still I have to wait a short time? Usually, my BAI boiler and VRC470 is discovered within 5 seconds after creation of the bridge. 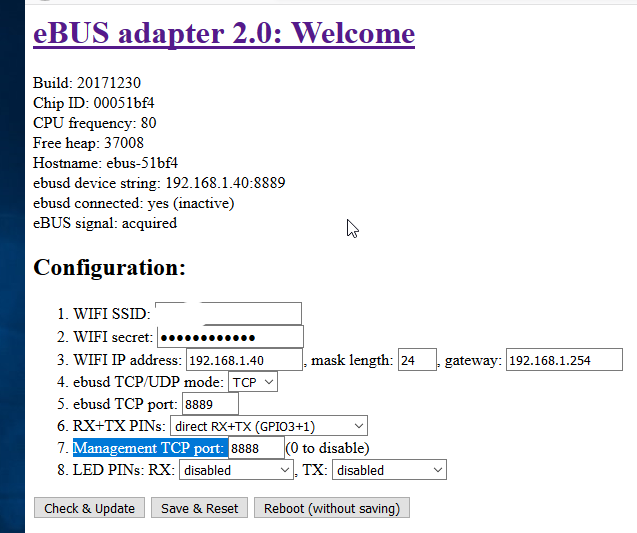 But before that, ensure that the ebus connected shows “no” on the adaptor web page, otherwize there is something still connected to it and your connection from the binding will fail to connect. And yes, you have to connect to 192.168.1.40 and port 8889. I managed to make the ebus binding talk to the bridge, but there is still some problem with the configuration. I created a thing for the bridge and one for the Vaillant (Ecotec Plus) burner with HEX slave address 08 in PaperUI. In the burner thing, there’s a long list of items that I can activate, but when I activate them none returns a neaningfull value. There is a No response from slave error message in the openhab log. The other ebus related log messages are added for reference. Am I missing something ? I’m using 2.2.0.201712041912 version of the binding. For reference, on the fysical bus, there is a vaillant Ecotec plus VCW burner and a tado extension kit. Below are the responses I get when I use ebusd to interrogate the bus. I switch off ebusd when the ebus binding is switched on and vise-versa. address 08: slave #11, scanned "MF=Vaillant;ID=BAI00;SW=0414;HW=7401", loaded "vaillant/bai.308523.inc" ([HW=7401]), "vaillant/08.bai.csv"
address 15: slave #2, scanned "MF=Vaillant;ID=37000;SW=0129;HW=6002", loaded "vaillant/15.370.csv"
after a long time I’ve created a complete new version with the latest changes. You can see all changes on github since a while. Please notice the new file format. At the moment I publish both formats, I’m not sure witch solution is better. See first post for all information and download links.